First Substantial Tomato Harvest of the Summer! 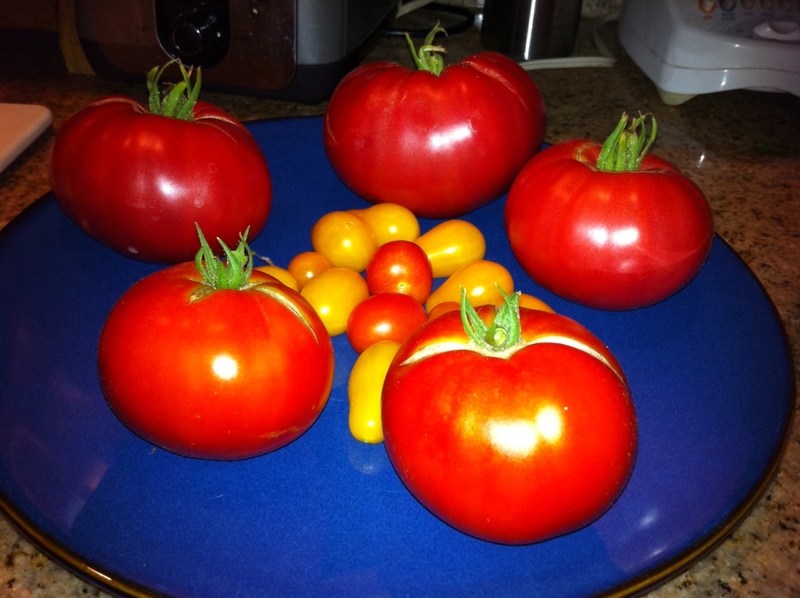 We’ve been picking and eating Sun Gold cherry tomatoes and Yellow Pear tomatoes on a daily basis for a couple of weeks now, but yesterday was the first time some of the other tomatoes were ripe and ready for picking…and all I can say is WOO HOO!!! 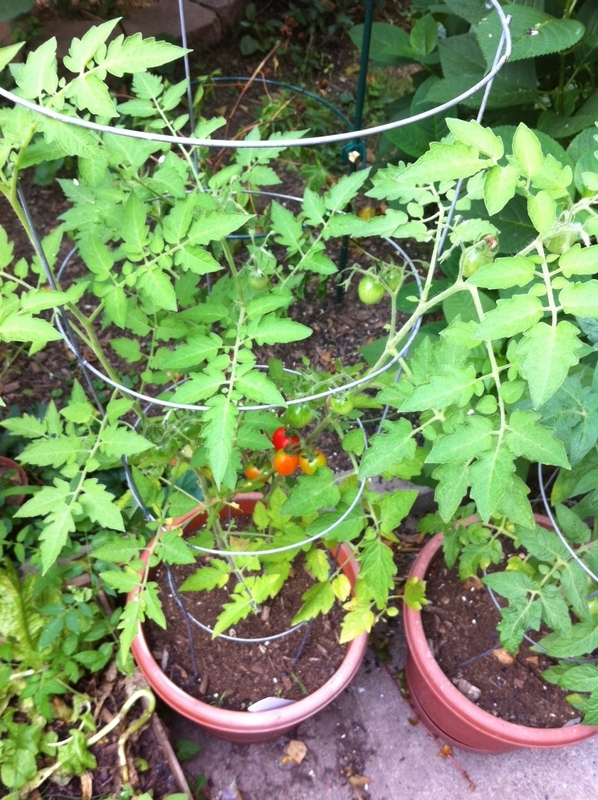 Those are two Early Bush ‘Goliath” tomatoes in the front. The three large tomatoes in the back are Mortgage Lifters. 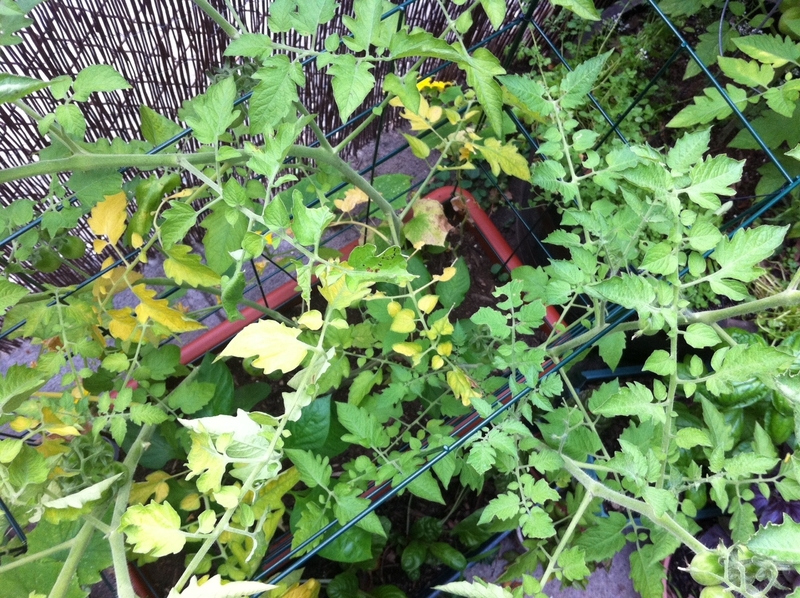 The small tomatoes in the middle are Sun Gold cherries, Yellow Pears, and Principe Borghese. 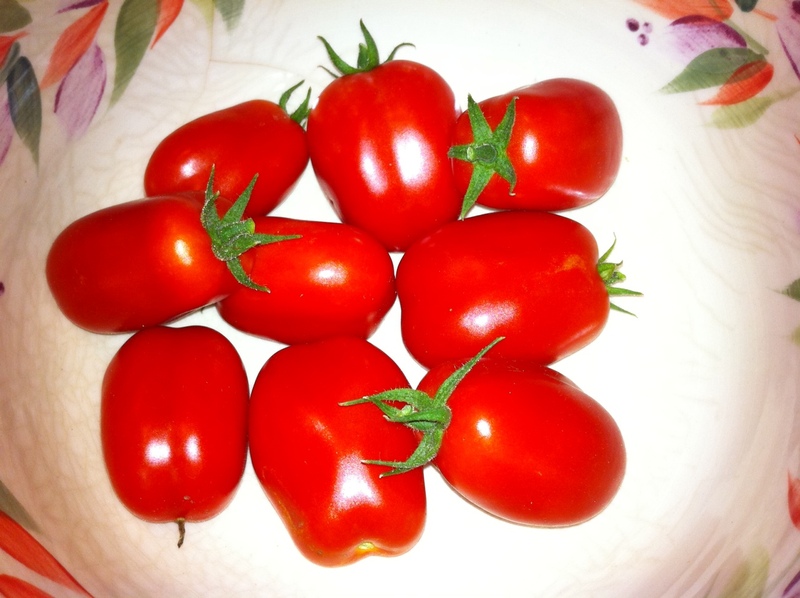 These lovelies are San Marzano plum tomatoes – the same tomatoes that just a week or so ago were suffering from Blossom End Rot. 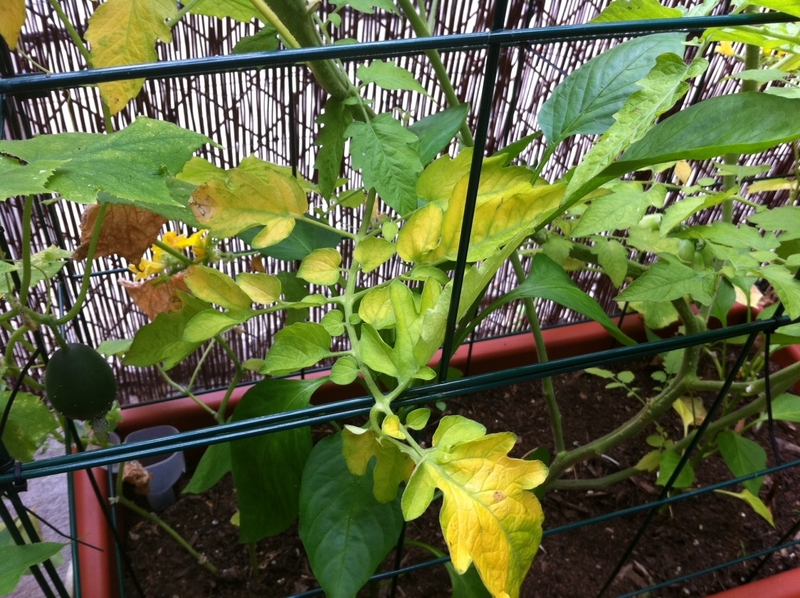 This time around not a single tomato (on any plant) had blossom end rot – hooray! 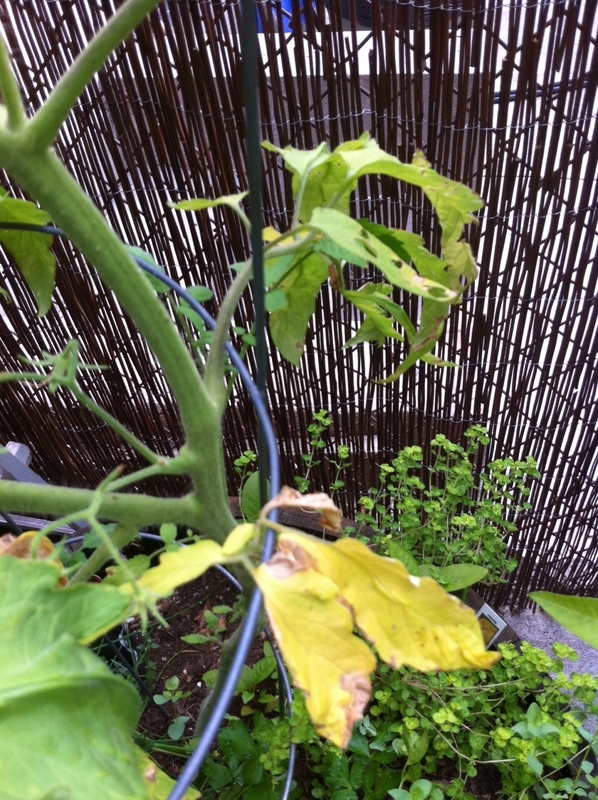 The slicing tomatoes were slightly split or cracked, which I understand is also a side effect of inconsistent watering (gee – I sound like a bad mother or something! I swear, I water regularly! ), but they should still be just fine to eat, and I cannot wait to dig into them the minute I get home from work today! A little salt, olive oil, and vinegar on some of these sliced up…I’d just about call that a meal! I was a little concerned at the beginning of the summer that I’d gone overboard and planted too many tomatoes for two people to keep up with, but I think we’ll manage just fine. If we start getting inundated over the month of August, I certainly won’t complain! It will just give me an excuse to start canning! The Dreaded Blossom End Rot Has Struck. 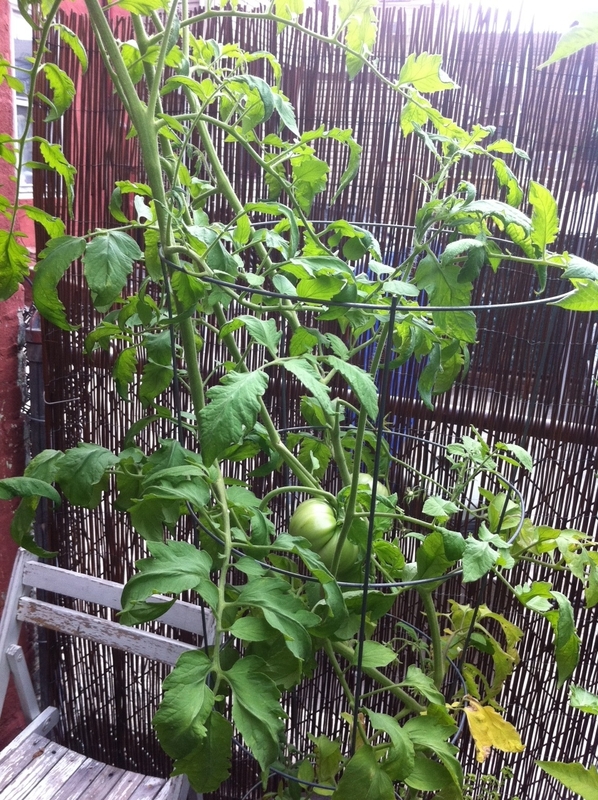 My tomatoes have been doing great. I was nervous for a while there because many of the leaves and stems on several plants were yellowing but after a healthy dose of additional compost and then some liquid Dr. Earth fertilizer a week later, they seem to have perked up. They are all planted in containers and therefore need a supply of nutrients to replenish those that leach out after watering. Oddly enough, the tomatoes planted in the enormous half wine barrels seemed to suffer more than those planted in smaller 5-gallon pickle buckets! Go figure. 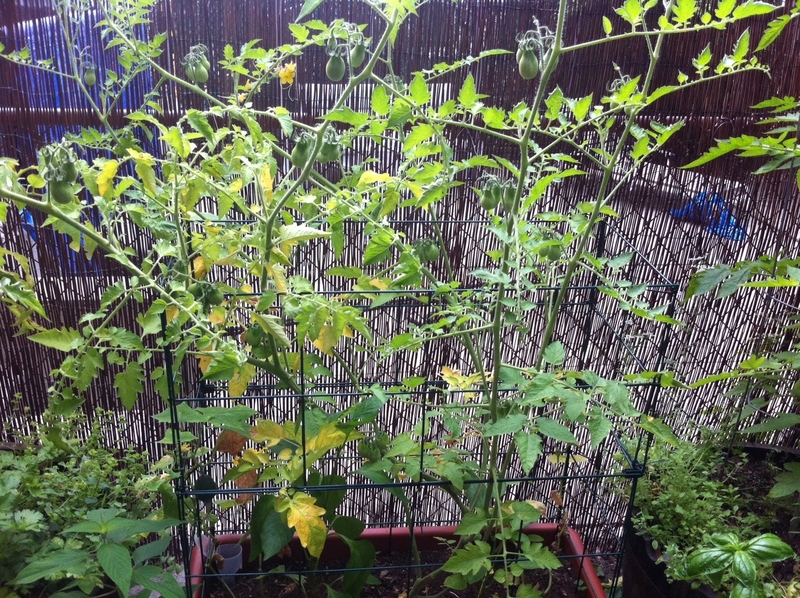 I was just glad they all recovered and we’ve been enjoying plenty of Sun Gold tomatoes from an out-of-control-happy seedling I got from Elaine over at Bucolic Bushwick a few months back – thanks, Elaine! 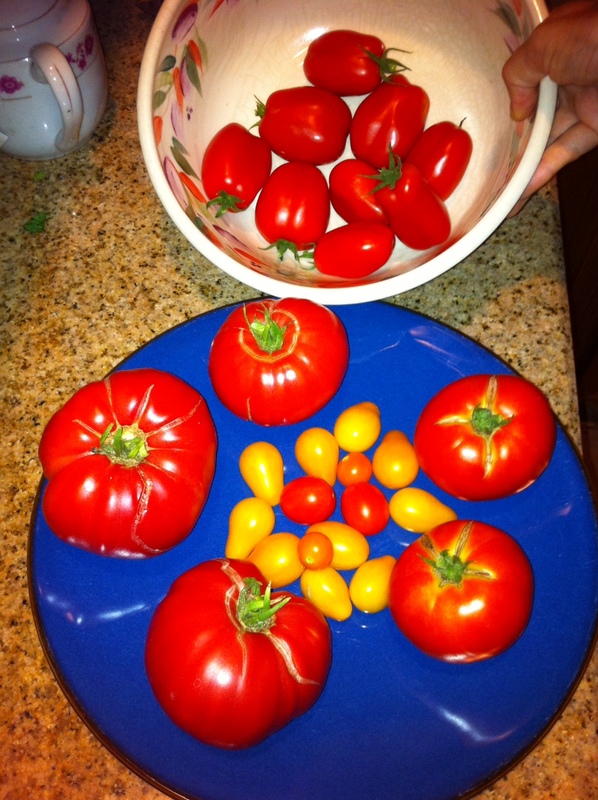 Principe Borgheses have also been delicious, and we’ve had plenty of decent yellow pear tomatoes. We’ve had our eyes on the Mortgage Lifters, which are starting to turn pink now, and on the San Marzano plum tomatoes, which look absolutely gorgeous…at least they DID until yesterday, when as I bent down to pick some weeds from another container I noticed a dark spot on the bottom of one of the plum tomatoes…and then another…and then another. 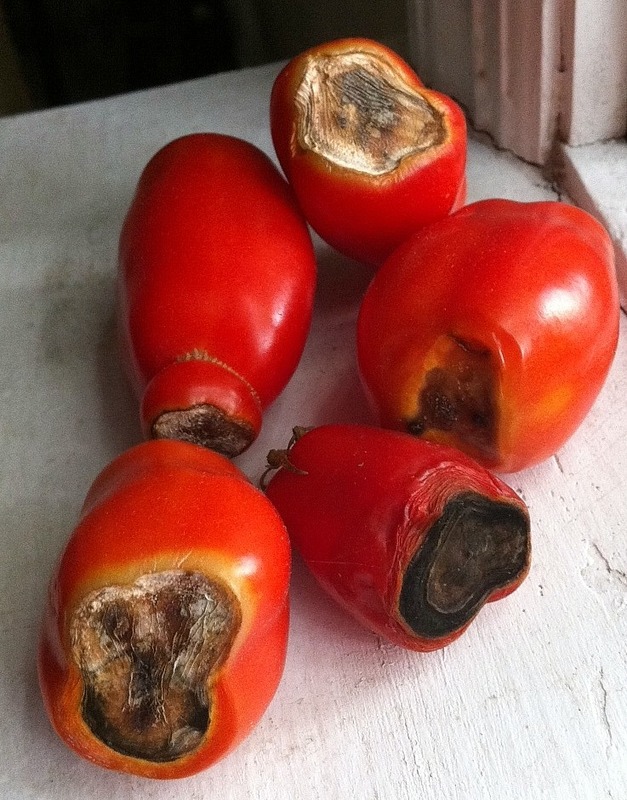 I know a little about blossom end rot and that it has to do with an inconsistent supply of water which affects the plant’s ability to draw up calcium when it needs it. I soak the mulched soil (not the plants) all around just until I see the first drops of water coming out the bottom of the barrels, which are raised up on casters for mobility as well as for drainage. The bottom quarter of each barrel is also filled with styrofoam packing peanuts for additional drainage. I’ve read of a few cases where people’s plants recovered and went on to produce healthy, BER-free tomatoes. Boy oh boy do I hope that’s the case here. 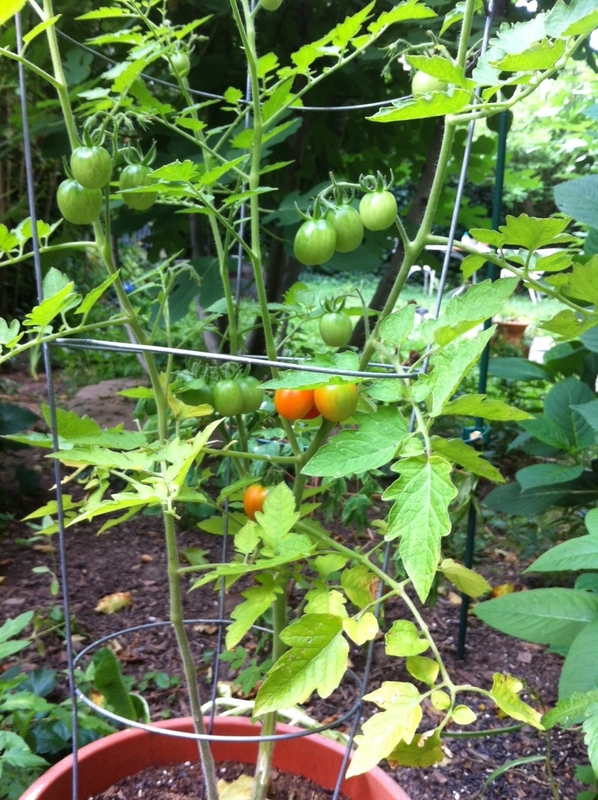 I was hoping to can some of these guys or have Mr. B make some of his amazing tomato sauce for canning. 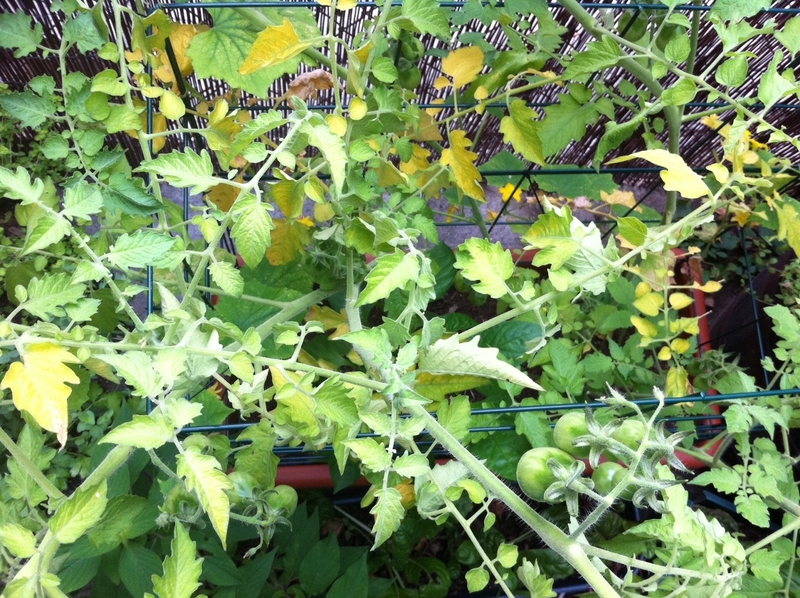 The afflicted tomatoes were removed in hopes of the plant being able to recover and put its energy into healthy fruit. All fingers and toes are crossed that the Mortgage Lifters will get by unscathed.